McGill hosted its annual event to showcase the work of undergraduate summer research projects. 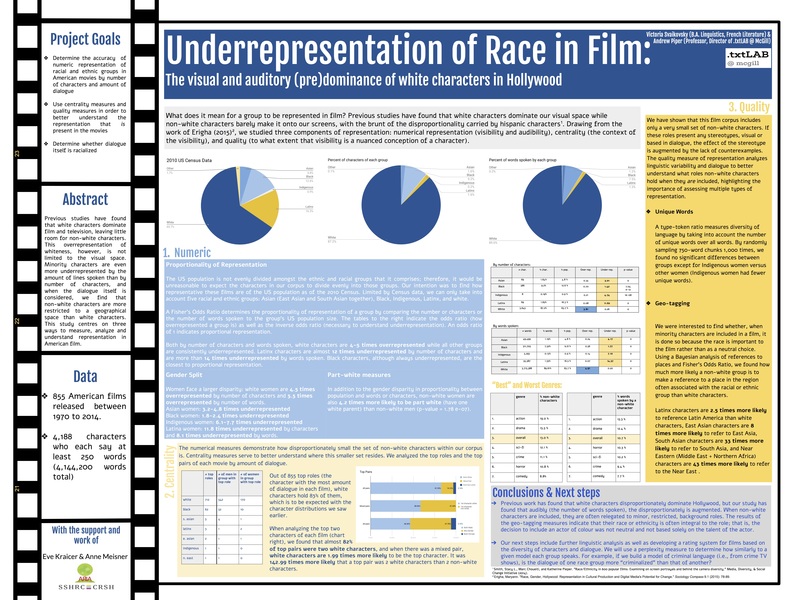 Among the many amazing projects was .txtLAB’s Victoria Svaikovsky who led a research project with two other students, Anne Meisner and Eve Kraicer-Melamed, on studying the intersections of race and Hollywood film using computational analysis. Their project aimed to better understand the racial inequality that has long been identified in academic and popular criticisms of Hollywood. Focusing on questions of visible and audible marginalization as well as linguistic tokenization with respect to visible minorities, Svaikovsky and her team have produced an impressive study of over 800 screenplays. Their work will be coming out as a lab white paper in the near future. Keep an eye out!